When the Civil War halted steamboat travel on the Mississippi River in 1861, an unemployed riverboat pilot named Samuel Clemens enlisted in the Missouri militia. After two weeks of service, Clemens abandoned his post and fled westward to begin a writing career — a turn of events that precipitated the rise to fame of the man who would become known as Mark Twain. The circumstances surrounding his departure are unclear; some view Twain as a deserter, while others call into question the nature of his commitment from the beginning. Twain defended himself in speeches and in print, offering varying accounts — with varying degrees of truth — of his confusion upon enrollment, his ignorance of the moral and political forces behind the war, and his claim to have killed a man while hiding in a corncrib. Regardless of the reason for his desertion, his personal experiences and the Civil War in general are recurring topics in Twain's speeches, fiction, and nonfiction. In addition to broaching the issue in longer works, such as Life on the Mississippi and The Gilded Age, Twain directly addresses it in shorter pieces such as "The Private History of a Campaign That Failed" and "A Curious Experience." 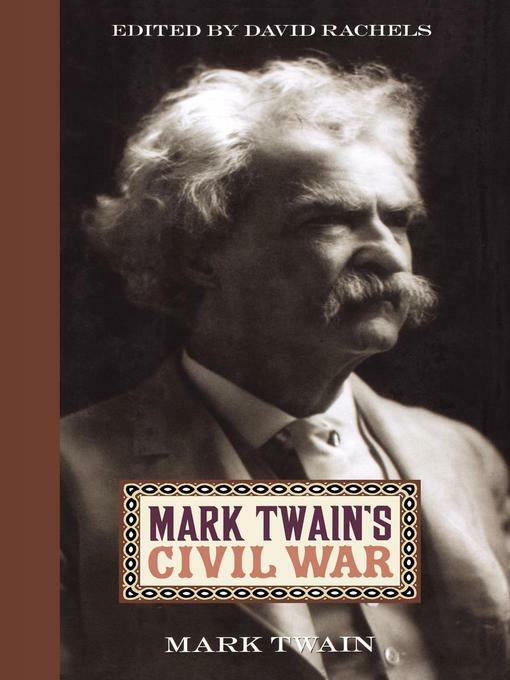 Editor David Rachels unites these selections in Mark Twain's Civil War, offering Twain fans and Civil War scholars the unprecedented opportunity to read the entire array of Twain's Civil War-influenced literature in one volume. In addition to Twain's own pieces, Rachels includes an account of Twain's war career by his official biographer as well as a story by Absalom C. Grimes, a Confederate mail runner who claims to have served with Twain early in the war. An introduction by Rachels completes the text, which analyzes Twain's military stint and assesses the war's profound influence on one of America's most celebrated authors.